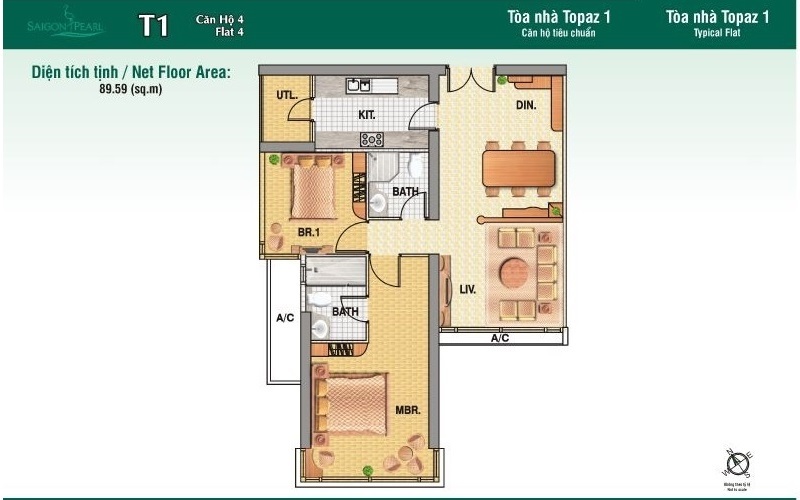 Saigon Pearl apartment for rent in Topaz Tower 1 has area of 90 sqm, inside include: 1 living room, 2 bedrooms, 2 bathrooms and dining room, fully furnished. Price for rent is 1000 usd/month. It is on 8th floor view to district 1, Saigon river. * A good service team formed by enthusiastic professionals. * Security 24/7.Cutting edge technology water system, Wi-fi, IPTV ,Separated High Speed Internet. * They are ready to afford the highest quality services for the residents. Contact us to view the apartment, price and furniture can be negotiable. Saigon Pearl apartment for rent Location: Nestled on 92 Nguyen Huu Canh Street and only 10 minutes drive from Saigon Pearl Apartments to Ho Chi Minh City center and tourist attractions: Reunification Palace, Notre Dame Cathedral, Opera House, Ben Thanh Market,… Saigon..
Saigon Pearl apartment for rent, in block Ruby tower 1, High Floor 31st floor nice view to district 1 and Saigon river, Open kitchen, price 1200 USD/month. Apartment for rent in Saigon Pearl Living Room furnished with Sofa, Loveseat, Coffee table,..
Saigon Pearl apartment for rent Elegantly furnished and fully equipped apartments, three-bedroom apartments, Beautiful, tasteful and of high quality furnished apartment, 90 sqm with all comforts, Modern Appliances, look spacious living. It only takes few minutes to go to the commercial..
Saigon Pearl apartment for rent in Binh Thanh District at Saigon Pearl building, located on Nguyen Huu Canh Street, Ward 22, Binh Thanh District, neighboring District 1, along the Saigon River, opposite the Thu Thiem new urban area, just 5 minutes..
Saigon Pearl apartment for rent has designed by professional architecture company with simple Euroupean style combining with elegant color, It brings you comfortable feeling, relaxed after hard work. Designed by main developer, every apartment has same layout with: . 2 bedrooms..